The fastest growing user demographics for Facebook are in the higher age ranges and social networking is quickly becoming more than just a past-time for youth - especially with the growth of niche social networks around particular themes or communities. We are also seeing the development of niche, high-end / luxury communities. In 2008 the FT launched it's luxury, Executive forum and since then others have been experimenting with exclusive communities. US site Affluence.org is a good example of this - launched last September, Affluence boasts 20,000 members and to join you have to prove that you have a net worth of £2m and an annual income of £214,000. Described as a 'virtual country club', Affluence contains blogs, a lifestyle guide and lots of advertising for private jets and luxury goods. Brands are also turning into platform providers and using SNS principles to further consumer engagement and loyalty. 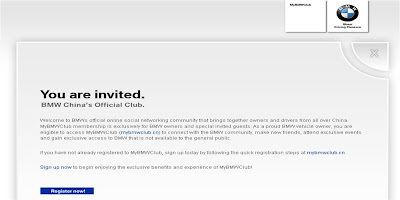 In China BMW has launched an exclusive social network for its drivers at MyBMWClub.cn. There are 150,000 BMW drivers in China and the site aims to connect drivers, offer advice and allow users to share their experiences with both BMW and other BMW users. 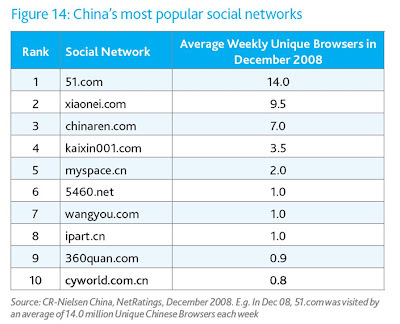 The dominance of local players in China's social networking scene means that BMW would have to create a bespoke solution if they wanted to build a community on an existing Chinese social platform. Therefore BMW creating their own social network site in China seems to make a lot of sense - whilst BMW have declared no intention of taking this outside China, having a proprietary solution will make it easier to follow this route later. Interesting to see how this turns out, and with Land Rover now using Twitter hash tags in their advertising, it could be that we are about to see an explosion in high end brands properly incorporating social thinking into their marketing efforts?